Sign Up Now! Open a betED.com Sportsbook Account! You know that little restaurant around the corner that has the best service, the price is right and you’re always glad you go there? betED.com is a lot like that. Sometimes being the biggest doesn’t mean being the best and betED has proven that treating the customer right and offering the best service can pay off bigtime. One of the fastest growing online sportsbooks, betED.com has been in business for over a decade and with “player-first” perks like sportsbook bonuses on every deposit as well as huge casino bonuses and a 100% initial poker room bonus, not to mention their much heralded customer service and VIP department, it’s safe to say that betED is here to stay. 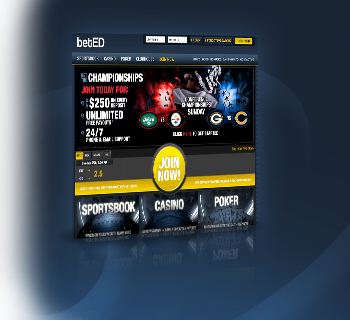 betED.com boasts a dedicated sportsbook department that features odds on all major, and some minor, sports and leagues. While they do have action on all the big events and leagues, if you’re the kind of player who likes looking for the more obscure events (Ukranian Junior Boxing anyone? ), betED.com might not be for you. They do not have a full service racebook and their collection of futures and “if” bets are severely limited, however they do make up for these deficiencies by offering their brand new InPlay Live Betting experience. Ever think you’re going to get a huge bonus, but then been hung out to dry by a sportsbook? Well, one thing we can say for sure – betED.com will not do that to you. One of the only sportsbooks to offer bonuses on every single deposit, at betED.com you’ll get a minimum of 10% extra each time. Their weekly emails usually contain even higher bonuses and your first time depositing for the casino and poker room nets you a 100% bonus for each. betED.com is not a leader in setting its lines, meaning there can be a slight delay of a few minutes between seeing odds posted elsewhere and them actually getting up on their site. That said, they are not afraid to move the lines at a moment’s notice, so smart bettors should make sure to jump on a line when they see one they want. On many events betED.com does not offer Money Lines, but that generally changes as an event gets closer to post. They do offer the ability to buy points with only slightly different payouts, as well as Parlays, Teasers and Special Teasers. Tired of speaking with someone new every time you call? betED.com has a small, but dedicated, customer service department that is available to help you 24/7. Their staff are friendly and respectful and won’t leave you hanging minutes before the big game. They boast one of the fastest email response times (usually within the hour) and their VIP department is renowned for treating long-time members the right way. Despite boasting several more withdrawal methods for international players, most members (USA and Canada included) take advantage of betED.com’s ACH/Instant Check option where you can make deposits and request payouts directly to your bank account! The process to get signed up for this is a lot easier now that their form is 100% online, but you will have to wait up to 10 business days after a deposit to have any funds available for withdrawals. Generally, however, payouts are received very fast – with some members getting money within 24-48 hours after making their initial request. Canadian players usually receive InstantCheck funds within 3-5 business days. While still in its infancy-stage, we like what we’ve seen from the betED InPlay Live Betting system. Usually live betting is limited to a few of the “big” events each day, but they are increasing the events offered weekly. The InPlay betting interface is a dream. It looks good, it’s fast, it’s easy to understand and you’ll find options on betting quarters, halves, on players, etc. It seems all the months spent on development have paid off for betED.com as their InPlay live betting system truly is a game-changer. Get a 15% Bonus on your 1st deposit at BetED! Open a BetED betting account now!